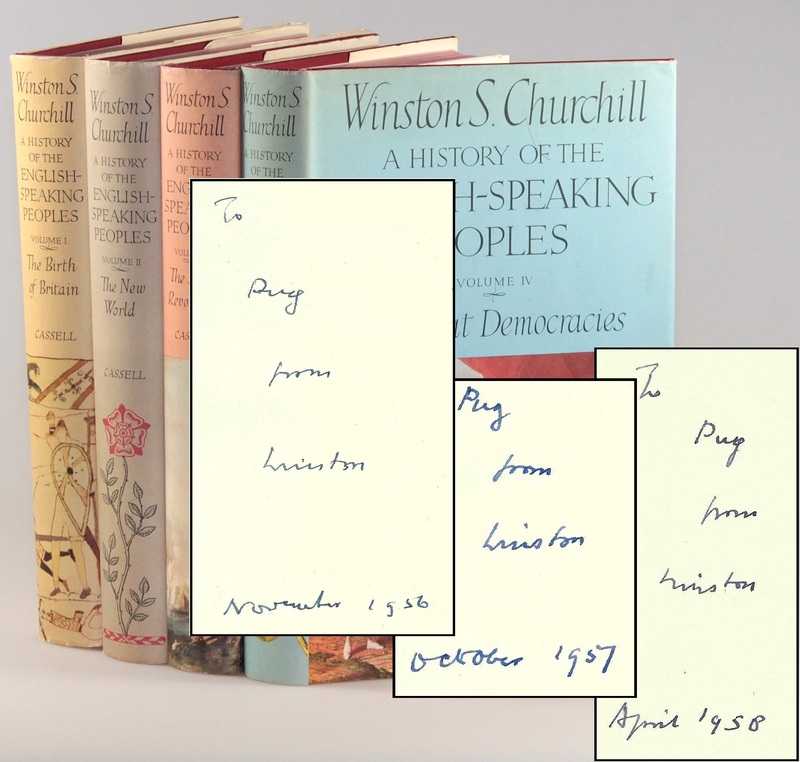 We recently had the privilege of cataloguing a remarkable, inscribed first edition set of Churchill’s A History of the English-Speaking Peoples. Only one collector will have the good fortune of being this set’s next owner, but it is compelling enough to merit sharing with a wider audience. Hence this post. This set is inscribed and dated in three volumes to Churchill’s close friend and indispensable wartime Chief of Staff, General Lord Hastings Lionel “Pug” Ismay, 1st Baron Ismay (1887-1965). Each of the three volumes is intimately inscribed using Ismay’s nickname and Churchill’s first name. 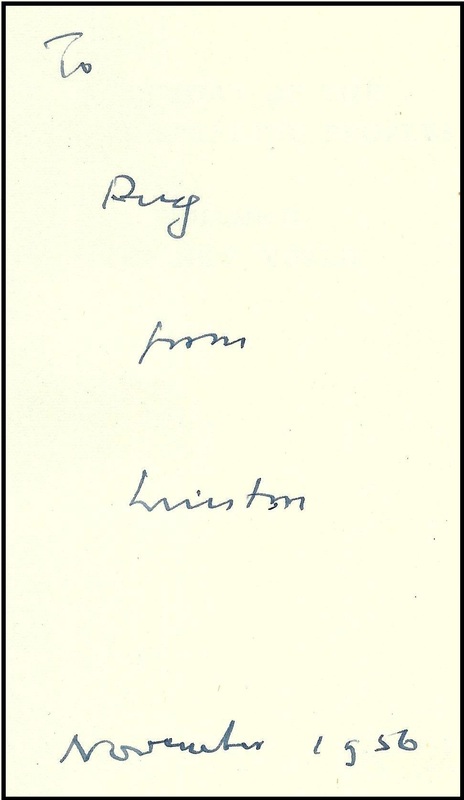 Volume II is inscribed in five lines in black ink: “To | Pug | from | Winston | November 1956”. 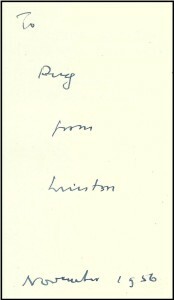 Volume III is inscribed in four lines in blue ink: “Pug | from | Winston | October 1957”. 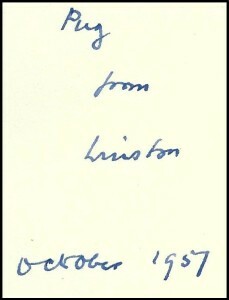 Volume IV is inscribed in five lines in black ink: “To | Pug | from | Winston | April 1958”. This was Churchill’s own and ultimate tribute to his friend. 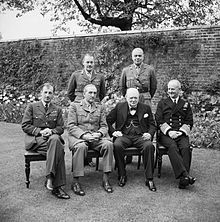 When Churchill’s second premiership began in October 1951, Ismay was first appointed Secretary of State for Commonwealth Relations and, swiftly thereafter, Secretary-General of NATO, a post he held from 1952 until his retirement in 1957. Like Churchill, Ismay was educated at Sandhurst and saw early service as a cavalry officer in India. Unlike Churchill, Ismay did not leave soldiering for politics. By the early 1920s, recognition of his talents and his performance at the Staff College in Quetta ended Ismay’s regimental soldiering. 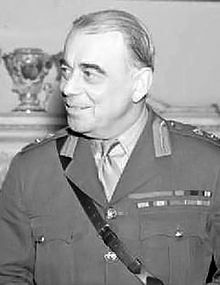 Ismay would serve the Committee of Imperial Defence in various capacities, becoming CID Deputy Secretary in 1936 and Secretary in 1938, and being promoted major-general in 1939. 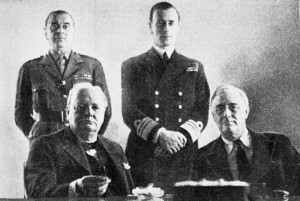 “Inadequacies of government policy made the months before and immediately after the outbreak of war in 1939 the most frustrating of his life.” (ODNB) But in April 1940, Prime Minister Neville Chamberlain chose Ismay to assist Churchill in his role as chairman of the ministerial co-ordinating committee. A month later Churchill became Prime Minister. Ismay would be promoted Lieutenant-General in 1942 and General in 1944, and made Baron in 1947. 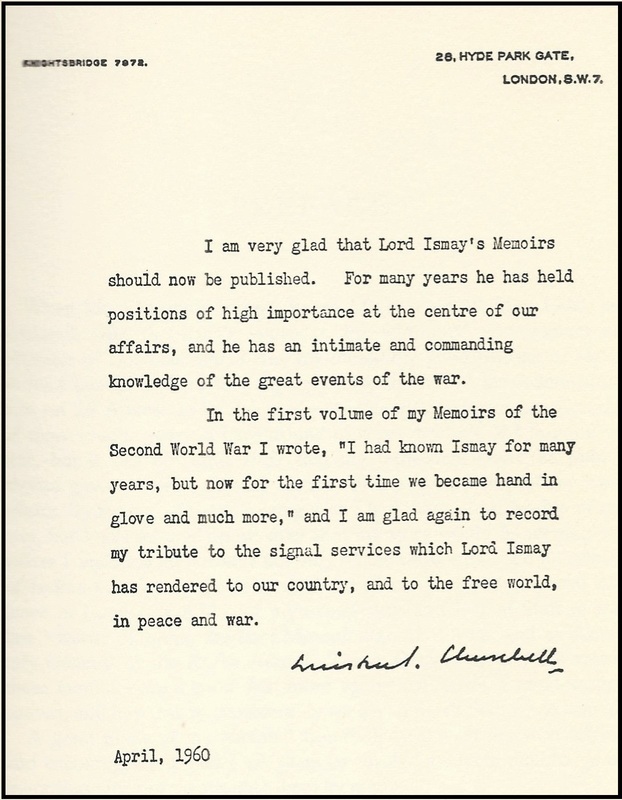 When Churchill inscribed these books to Ismay, both men were entering their twilight, both adding final words to a lifetime of deeds. 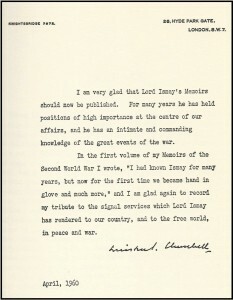 Two years after Churchill inscribed his final volume of A History of the English-Speaking Peoples to “Pug,” Ismay’s own Memoirs were published, opening with a Tribute from Churchill “to the signal services which Lord Ismay has rendered to our country, and to the free world, in peace and war. 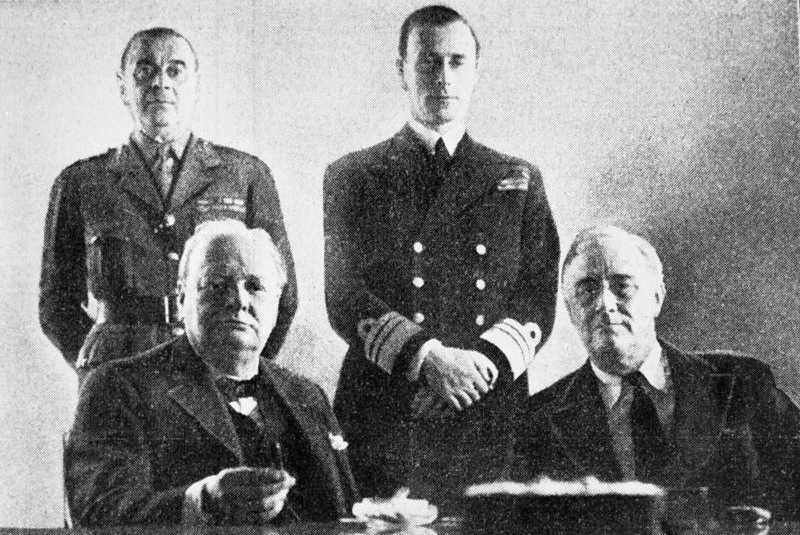 Churchill was the guest of honor at a London dinner to celebrate the publication of Ismay’s Memoirs. (Gilbert, VIII, p.1315) Both men died in 1965. A History of the English-Speaking Peoples is Churchill’s sweeping history and last great work. The first draft was completed just before the Second World War, but the work was not completed and published until after Churchill’s second and final Premiership, nearly 20 years later. The work traces a great historical arc from Roman Britain through the end of the Nineteenth Century, ending with the death of Queen Victoria. Perhaps not coincidentally, this is the very year that saw Churchill conclude his first North American lecture tour, take his first seat in Parliament, and begin to make history himself. 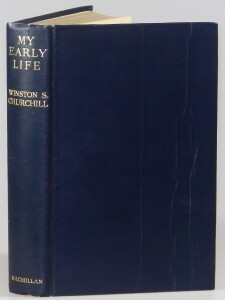 The first British edition is regarded as one of the most beautiful productions of Churchill’s works, with tall red volumes and striking, illustrated dust jackets. Churchill seems to have taken an active and detailed interest in the aesthetics of the publication. He told his doctor: “it is not necessary to break the back of the book to keep it open. I made them take away a quarter of an inch from the outer margins of the two pages and then add the half-inch so gained to the inner margin.” He was clearly satisfied with the result, remarking with pardonable exuberance “It opens like an angel’s wings.” (Gilbert, Volume VIII, p.1184) Unfortunately, as beautiful as the first editions are, they proved somewhat fragile. The dust jackets commonly suffer significant fading, wear, soiling, and spotting, and the books typically bear spotting and fading of the red-stained top edges. To read more about the first edition of Churchill’s A History of the English-Speaking Peoples in our online Guide to Churchill’s Books, click HERE. 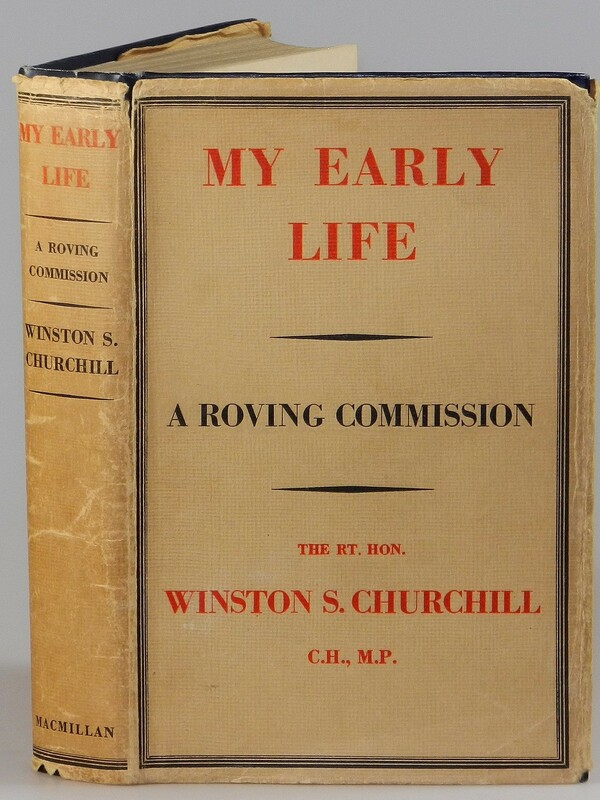 In recent years, several items inscribed by Churchill to Lord Ismay have been offered, but few as first edition sets in original bindings. The inscriptions would make this set special even if it were rebound and later printing, but the fact that it is first printings in original bindings makes it especially compelling. This set is currently offered for sale HERE. History is often told from the perspective of great events and the great personalities who shape them. The few who conspicuously make history are also those most likely to record it; the voices of the many who are busy living history are often lost. 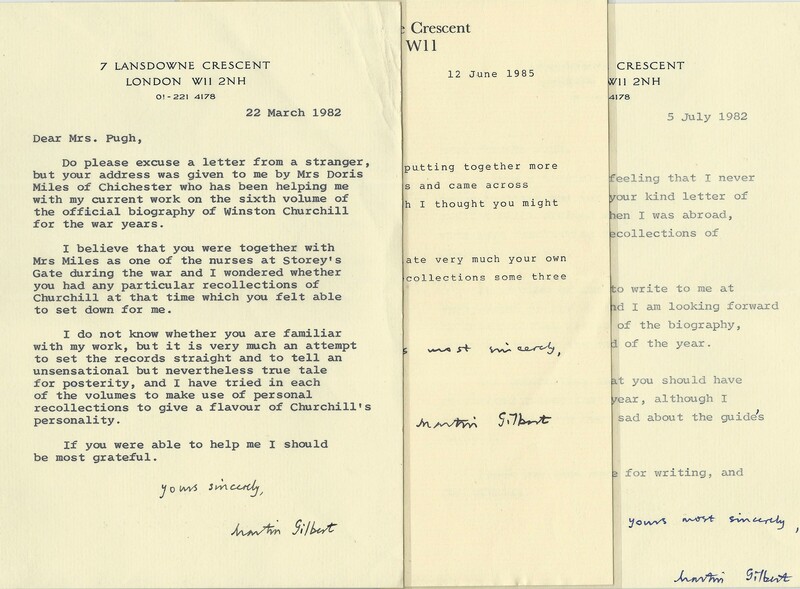 That’s why an archive we have recently catalogued is so remarkable, offering an intimate, detailed, and uncommonly common perspective on the Second World War and one of its greatest figures, Winston Churchill. 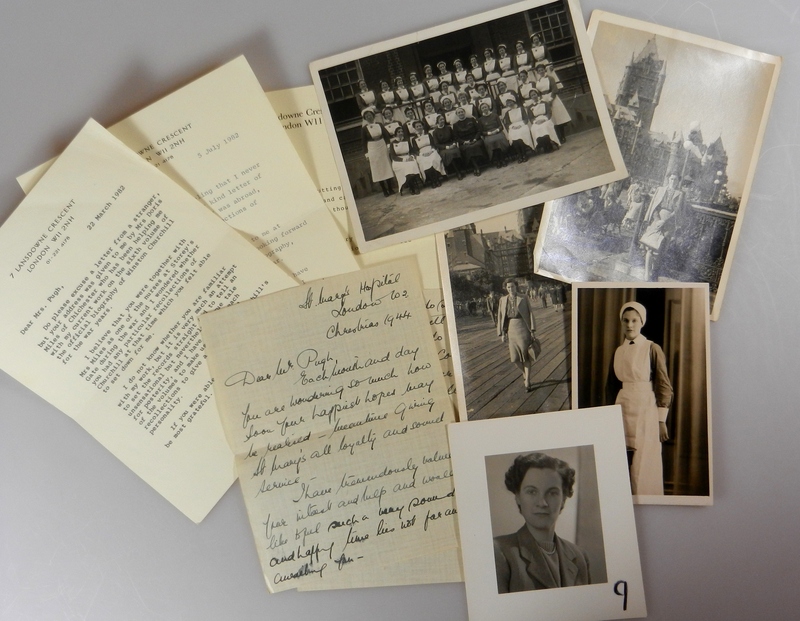 This remarkable Second World War archive belonged to Churchill’s wartime nurse, Dorothy Pugh (1919-2014). 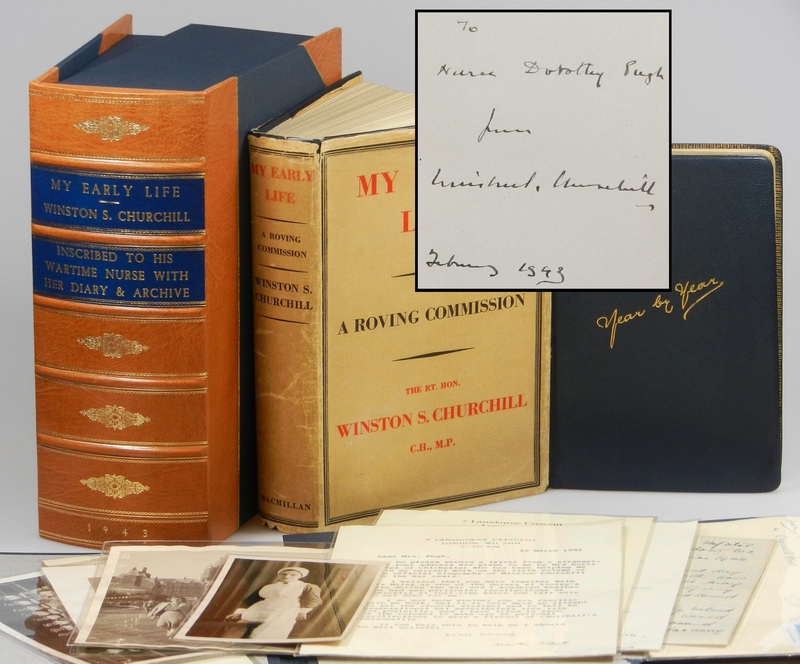 It includes her inscribed copy of Churchill’s autobiography, her personal wartime diary, photographs and wartime correspondence, and later correspondence from Churchill’s official biographer, Sir Martin Gilbert. In February 1943, Churchill was struggling to recover from a series of illnesses, the most recent of which was pneumonia. 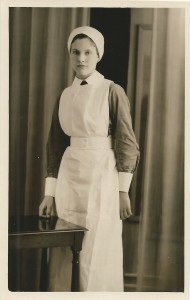 Churchill’s doctor, Sir Charles Wilson (made Lord Moran that March), Dean of St. Mary’s Hospital Medical School, hired a young St. Mary’s nurse to attend the Prime Minister. By the following day, it was decided she would reside with the Prime Minister: “Am going to live in as it’s a rush to get here in the morning.” She would stay with him for several weeks, and thereafter as needed. For the next eighteen months, Nurse Pugh would not only serve the Prime Minister in London, but also accompany him to Chequers and travel with him to both the first and second Quebec conferences with Roosevelt. 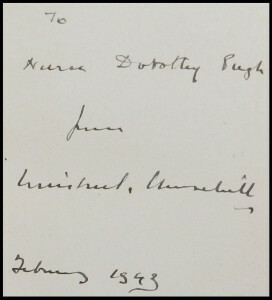 During her first week with Churchill, he gave her a copy of My Early Life inscribed: “To | Nurse Dorothy Pugh | from | Winston S. Churchill | February 1943”. 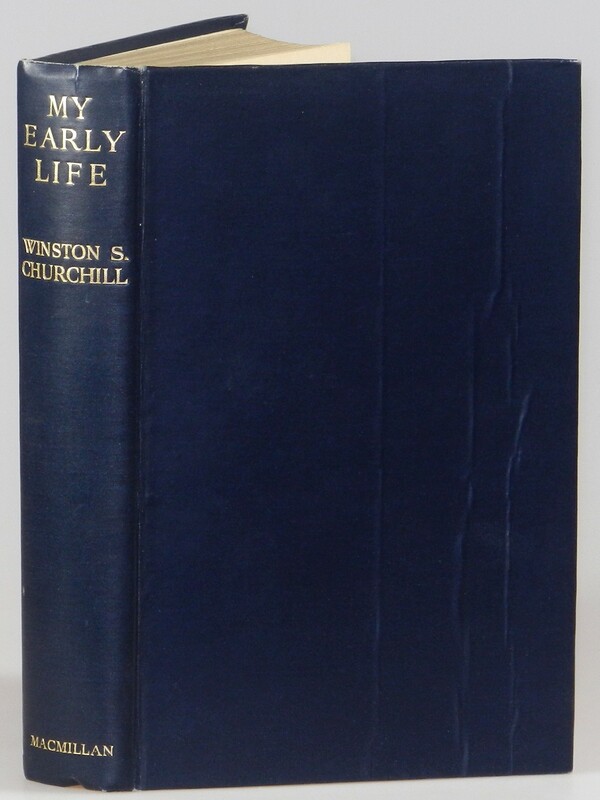 Her inscribed copy of My Early Life is the 1941 first printing of the wartime Macmillan reprint from the 1930 first edition plates. Macmillan acquired the rights to several Churchill books after the original publisher, Thornton Butterworth, went under in 1940. There were ultimately four Macmillan printings of My Early Life between 1941 and 1944. The first printing is both aesthetically superior and distinctly different from the three subsequent printings, printed on thicker paper than later printings. 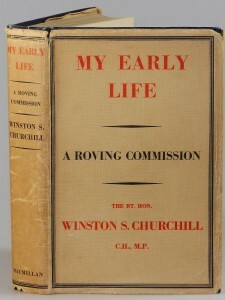 The first printing dust jacket also differs in the Churchill titles it advertises on the rear face. 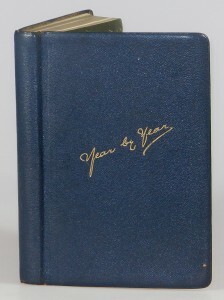 Nurse Pugh’s inscribed copy is in near fine condition except for wrinkling to the front cover binding cloth, which appears to be a binding flaw rather than the result of any subsequent damage. The dust jacket is in near very good condition, showing overall age and wear, including modest spine toning, with only minor losses to extremities. 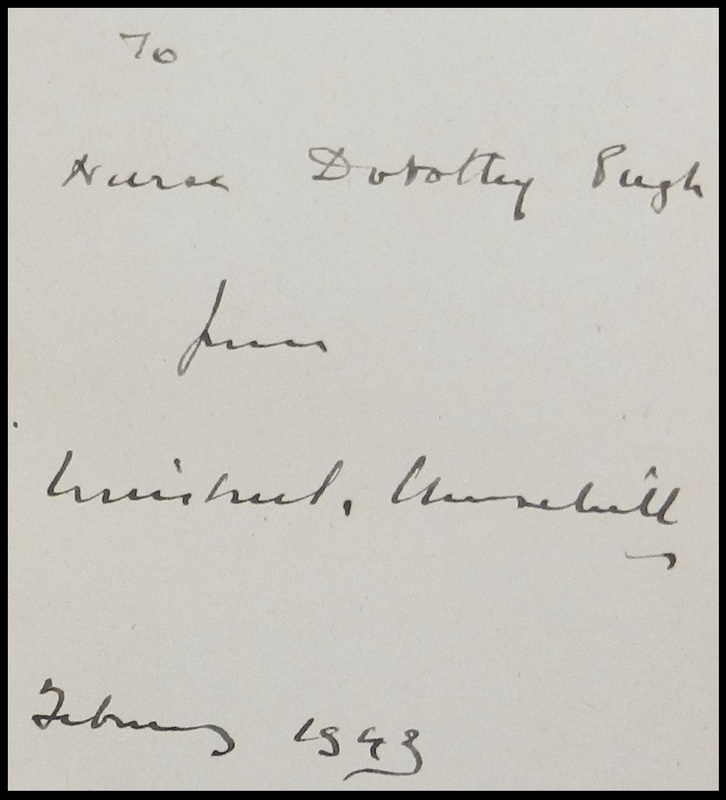 The inscribed book is significant, but Nurse Pugh’s remarkable personal diary is what truly anchors this archive, primary source material with myriad unique glimpses of wartime history – and of Churchill himself. 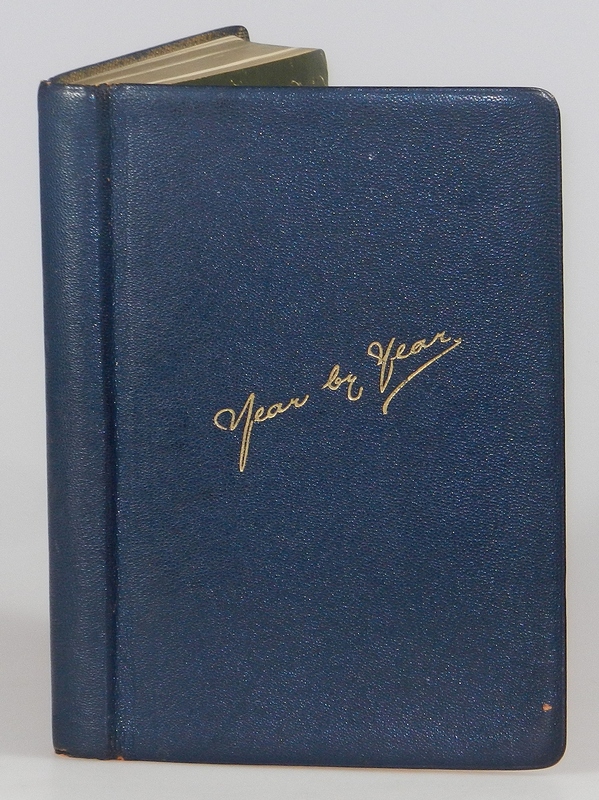 The diary, in superior condition in the original blue leather binding, bears entries spanning 1942 to 1946. Nurse Pugh’s entries juxtapose movie reviews, enthusiasm for eggs, and concern for her RAF husband with first-hand accounts of Churchill and key wartime figures that range from humorous and poignant (“Bed bathed P.M…. Mrs C as an audience – not a very pleasant job – still all was well. P.M. very sweet.”) to grave import (“PM told me that Tunisia will be O.K. now.”). 28 January 1943 Two letters from Roger… It’s a year now since R. joined the R.A.F. 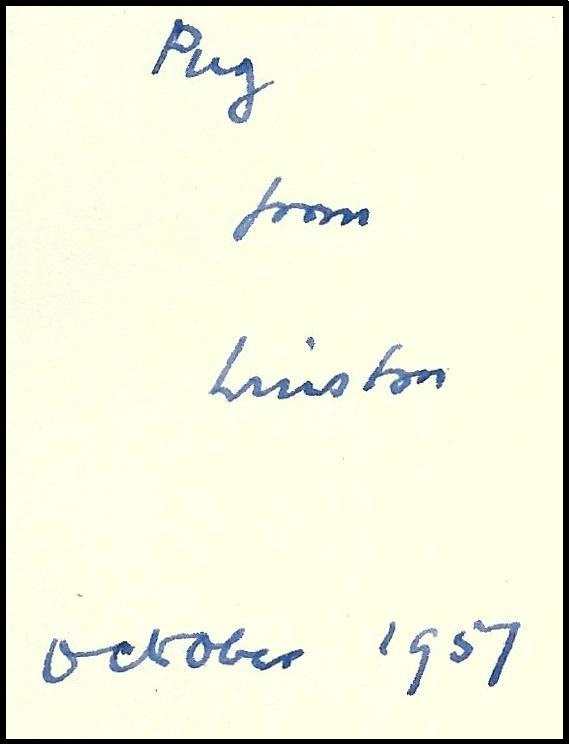 The three letters from Gilbert are included in this archive, as are five photographs of Nurse Pugh, among them two taken in Quebec during her travels with Churchill, as well as a Christmas 1944 letter to Nurse Pugh from her superior at St. Mary’s Hospital. Nurse Pugh’s diary was given to her by her fiancé, Roger. In February 1942 Roger was posted. They married in May. Roger served in the RAF with the 252 Squadron, flying Bristol Beaufighters in the Mediterranean, including Libya and Greece. Interspersed among the historic personalities and great events her diary records, it also records private moments of both fraught concern and staid resolve for her husband. Roger survived the war; they would have two children and six grandchildren. At the end of her long life Dorothy Pugh was remembered for many things – a generous nature, charity work, love of gardening and keenness for ornithology – but perhaps most for her wartime service to Churchill. 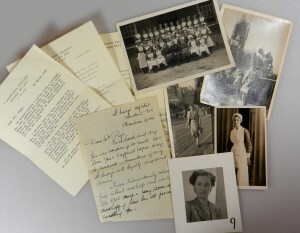 Her unique experience is remarkably encapsulated and illuminated in this archive, in both Churchill’s hand and her own. I could prattle on at length about Nurse Pugh’s perspective on wartime Britain and Winston Churchill, but since we have the benefit of her diary, I will spare you more of my prose and share excerpts from her diary entries. 17 January 1943 Air raid warning went at 8:30 pm – real gun fire so quite noisy for about 20 mins. All patients good. Dr. Gosse came to see if everyone O.K. 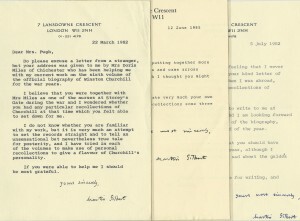 28 January 1943 Two letters from Roger. Telephoned o.w. after duty. It’s a year now since R. joined the R.A.F. 3 February 1943 Felt depressed & had jolly good howl. Felt much better after. 1 March 1943 “P.M. had cinema show after tea – 7 pm. I went. Saw 2 news reels + “Nine Men”. Quite good.